I think we have to rename an option from the "Default editor to use" drop-down list from Text to Wiki. 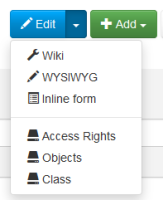 When you want to edit a page you have 2 options for Wiki and WYSIWYG, but in a user's profile preferences we have either Text or Wysiwyg. Also we could capitalize the text for the WYSIWYG option.